Going out to a restaurant, and paying somebody for the privilege of cooking your own meal, might seem like a contradiction in terms. After all, isn’t the point of dining away from home letting somebody else do all the work? Normally, I’d say yes, but at Slappy Cakes (4246 SE Belmont, Portland), letting the cooks cook is missing out on the essential experience. Slappy Cakes has taken the concept of tableside cooking (popularized by the fondue chain The Melting Pot, where you submerse your raw or naked entrée into a pot of hot oil or melted cheese) and flipped it over, turning it into a breakfast adventure. Griddles are built into each table, encouraging diners to make their own pancakes right there. There is a pretty substantial breakfast and lunch menu that includes items like chicken fried steak, huevos rancheros, burgers, and salads, but where’s the fun in that? Most diners opt for pancake batter (available in buttermilk, pumpkin, whole grain and gluten-free); an 8-ounce bottle costs $5.00 and is plenty for two people. The real fun is in the fixin’s; they cost $1 each, and you can choose from a baker’s dozen of toppings, including bacon, hazelnuts, fruits, and lemon curd. Pancakes are served with whipped butter and a trio of homemade syrups (indeed, Slappy Cakes is committed to the organic, sustainable foods movement, sourcing most of their menu items from local and regional vendors; in fact, there is an outdoor courtyard where they grow their own herbs, berries, and vegetables). There is an impressive drink menu that includes an extensive array of breakfast cocktails (Bloody Marys, mimosas, and a concoction called Whiskey For Breakfast, among others), making the concept of “happy hour” seem quaint and pointless. Pancake paintings drive the point home. Stepping inside the restaurant, you can feel waves of heat emanating from the griddles, making Slappy Cakes the perfect respite from chilly winter mornings (though I worry that it may be uncomfortable during the summer months, despite an array of giant ceiling fans mounted overhead). 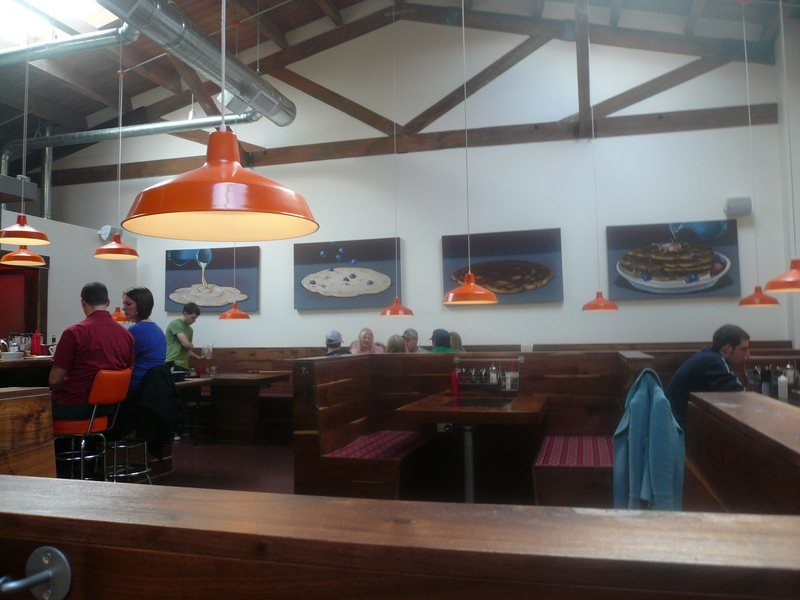 The restaurant is roomy, the decor bright and cheery and appealingly orange. We were seated at a booth, and I immediately stripped out of my jacket. After ordering non-alcoholic drinks (our sodas seemed too watered down), we decided on buttermilk batter with three fixin’s (bacon, blueberries, and chocolate chips), and ordered side dishes of bacon (because you can never have too much bacon) and breakfast potatoes from the a la carte menu. Service was quick, and our waiter gave us a quick rundown on what was what and how to cook the pancakes. I squeezed a few dollops of batter onto the sizzling griddle, added fixin’s, flipped the pancakes when they were ready to be turned, and the whole thing took about five minutes. It’s hard to go wrong with pancakes on a griddle; they’re basically foolproof as long as you don’t get distracted and forget about them, an unlikely scenario considering the fact that they are cooking inches away. Pancakes cooking on the griddle, complete with fixin’s. The pancakes were light and fluffy, and the house made syrups outstanding. Best of all was the bacon; it added a slightly chewy, savory texture that perfectly complemented the sweetness of the maple syrup (anybody familiar with Voodoo Doughnuts’ infamous Bacon Maple Bar will understand how delicious this particular combination is). The blueberries were plump and juicy and very good, though we were not impressed with the chocolate chips, deciding they would appeal more to the elementary school set. Both side dishes were excellent; the bacon was perfectly cooked, slightly crispy and smoky, while the breakfast potatoes were chewy on the outside and soft in the middle. 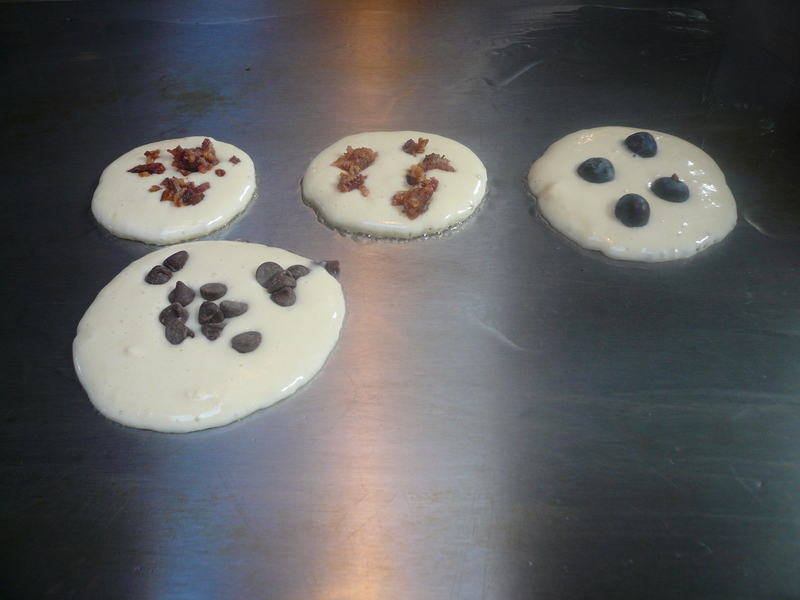 Prices are reasonable, and the fun factor makes Slappy Cakes the ideal spot for families. Throw in a breakfast cocktail, and everybody is happy!